An October 26 letter by the Department of Economic Affairs Secretary lays bare the Finance Ministry's worries. Excerpts from the DEA Secretary's 26 October letter to the Ministry of Corporate Affairs. 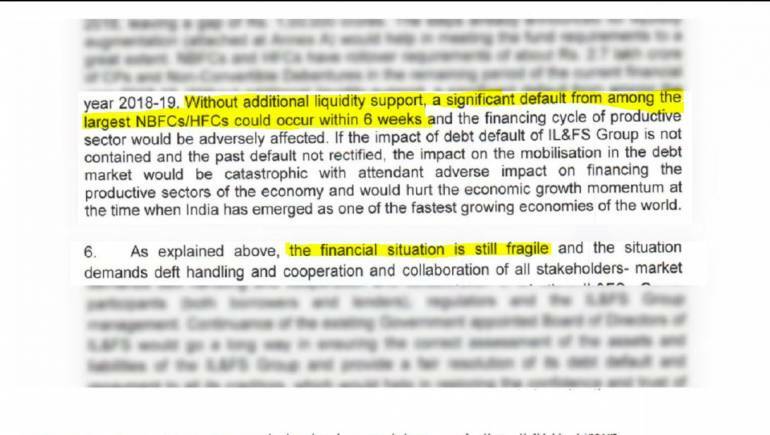 The Department of Economic Affairs (DEA) fears “significant default” from large non-banking finance companies (NBFCs) and housing finance companies (HFCs) in the next 6 weeks if additional liquidity support is not forthcoming. Moneycontrol has reviewed a copy of this letter. The DEA's fears underline key issues in the ongoing spat between the Reserve Bank of India and the government. The government wants the central bank to provide liquidity support to NBFCs and HFCs, and relax lending strictures for weak banks. The RBI, on the other hand, believes that the liquidity situation is under control and is loath to relax its rules for weak banks with the NPA problem still on the mend. NBFCs and HFCs are increasingly significant for credit flow to the economy capturing the space ceded by weak public sector banks. Their business model is largely founded on borrowing from banks and mutual funds to finance their loans. After the IL&FS default which led to the sale of debt and redemption in mutual funds – with outflows of Rs 2.11 lakh crore in September - NBFCs’ source of funding has dried up. In a Financial Development and Stability Council (FSDC) meeting on 30 October, the government warned the central bank about the NBFC liquidity crisis spilling over to other sectors. The RBI is said to have assured the government that the liquidity situation has not gone out of hand and has continued to provide systemic durable liquidity through open market purchase of government bonds. The outcome of that meeting appears to have triggered a full-blown confrontation between the Finance Ministry and the Reserve Bank. Media reports were abuzz yesterday that the government had or was considering invoking a rare law (Section 7 of the RBI Act) to make the central bank act on its view, and that RBI Governor had threatened to resign on this subject. It later took the Finance Ministry to issue a statement, saying the autonomy of the central bank was “essential”. A prolonged liquidity distress will significantly erode the NBFCs' credit standing, and prove negative for the broader economy as a slowdown in credit growth will dampen overall consumption and economic growth, credit rating firm Moody's Investor Service said in a October 15 note. However, commentary from the management of a few financial sector firms indicates that liquidity pressures might be waning. HDFC Asset Management Company, for instance, said liquid funds under management grew to Rs 75,000 crore in October compared to an average Rs 40,000 -50,000 crore. In an analyst call, Reliance Nippon Asset Management said inflows into liquid funds in October outpaced the outflows seen in September. “Given support coming in from banks for a buyout or onward lending, inflow into liquid funds, and RBI’s OMO, we believe it’s safe to assume that the risk-related to maturity of NBFCs/HFCs is likely to wane over the next 20 days,” said Edelweiss Research in a 1 November note. On 31 October, the new board submitted a broad resolution plan for IL&FS which included capital infusion at the group level, selling subsidiaries and resolution for specific assets.